Accumulate, display and even process data from hyphenated instruments as the data is being acquired in near real-time! View multi-dimensional hyphenated data in a number of different display formats. Report multi-dimensional data for subsequent use (output is available via direct data display, clipboard transfer or the many raster-based printers). FemtoScan is actively marketing the benefits of hyphenated analytical instruments (the Enviroprobe and the EVM II). However, we realized that, in order to take full advantage of the power offered by such a hyphenated system, the need existed for a tool to allow the user the ability to manipulate the hyphenated data (in real time) in multiple separation dimensions. Although a large number of other competing instruments (e.g., GC/MS, GC/FTIR, TG/MS, GC/IMS, etc.) have been commercialized as hyphenated systems, the software tools for examining data produced by these instruments have normally been limited to examining the data in one dimension (at a time) without drawing on the full power of the hyphenated separation. The failure to provide multidimensional data analysis tools reduces the analytical power of these hyphenated techniques to a single separation with a correlated confirmation. Although these programs do correlate the results of the two separations, this approach effectively removes the resolution improvement inherent in the hyphenated method by treating the dimensions individually. HYPHEN was developed to address these shortcomings. Specifically designed to handle data from hyphenated systems, HYPHEN is a tool which actually allows the "hyphenated" data to be treated as the output of a single, powerful multi-dimensional separation technique. This power comes from the ability to view, process and report data in multiple dimensions. The following illustration provides a simplified illustration of the importance of hyphenated separation techniques as opposed to multiple results from uncorrelated separations. 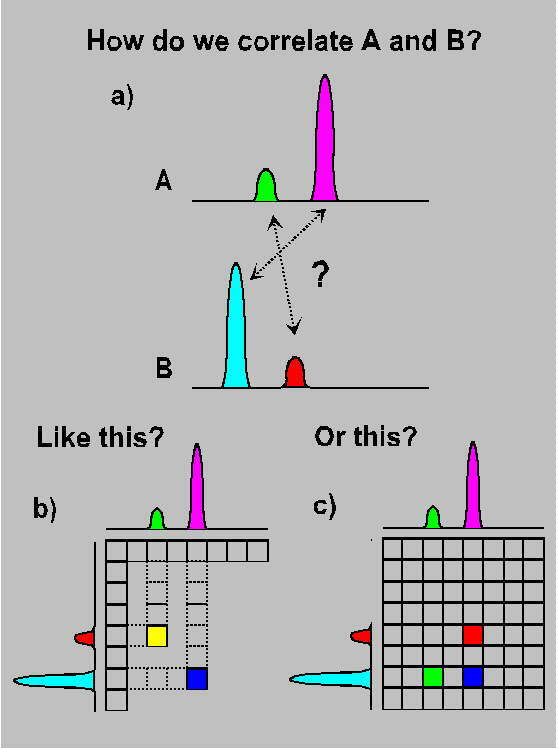 The top diagram represents two independent separations and illustrates the problem the analytical chemist faces when trying to correlate information from a hyphenated system that presents two-dimensional data in "multi" one-dimensional format. Although multiple separations may yield powerful information, it is impossible to correlate them without additional information (typically accomplished by conducting additional separations of pure standards which identify individual peaks with a particular compound or compounds). Assumptions regarding the proper correlation can be made, but then must be verified by performing additional analyses. However, by immediately correlating the data from these hyphenated systems and displaying the results in a two-dimensional format conclusive answers can be obtained with significant cost savings for the user. HYPHEN is a 32 bit WindowsTM application. It was originally developed under Windows for Workgroups (WFW) 3.11 using the Microsoft Win32s (version 1.25 or later) extensions. This platform supports all HYPHEN functions for data acquisition, processing, sharing and reporting. The software is compatible with Windows 95 and NT (version 3.51 or later), but does not require the preemptive multitasking capabilities of these newer Windows versions; requires 16 bit data acquisition modules for some supported hardware and not all 16 bit HYPHEN drivers are compatible with these new 32 bit Windows systems. FemtoScan continues to recommend the use of WFW and Win32s for data acquisition operations while data processing functions may be undertaken on any 32 bit Windows platform newer than Windows version 3.11 (i.e., Windows 95 and Windows NT version 3.51 or newer). HYPHEN is still in beta release format. Full data acquisition support under Windows 95 is anticipated for the final product release of version 1.0 while the question of full support for HYPHEN running Windows NT remains to be determined. The initial application of HYPHEN involves the development of computer data acquisition systems based on third party data acquisition cards and support of FemtoScan Enviroprobe TLGC related products. At present, we support selected data acquisition cards from National Instruments, Graseby Ionics ASP cards and direct control of FemtoScan Enviroprobe and EVM II TLGC systems. 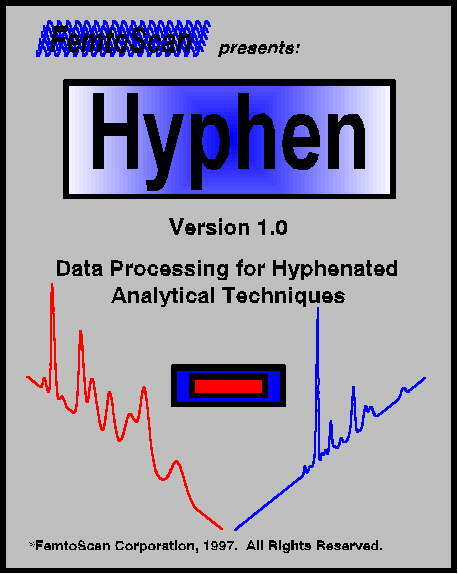 HYPHEN performs data acquisition functions via installable software device drivers. This approach allows HYPHEN to be flexible in the support of new hardware platforms. The addition of new hardware acquisition systems is on-going and we invite inquiries about the addition of new hardware to HYPHEN. As explained here, HYPHEN will provide you with the complete picture of your analysis. The result of using HYPHEN is a better technique for utilizing powerful instrument systems at their optimum performance levels which will provide to you conclusive results at maximum savings of resources! If you are interested in transforming your detector into a powerful, multi-dimensional system by combining it with FemtoScan's Enviroprobe module and HYPHEN software, please contact our application specialists by completing our information form.